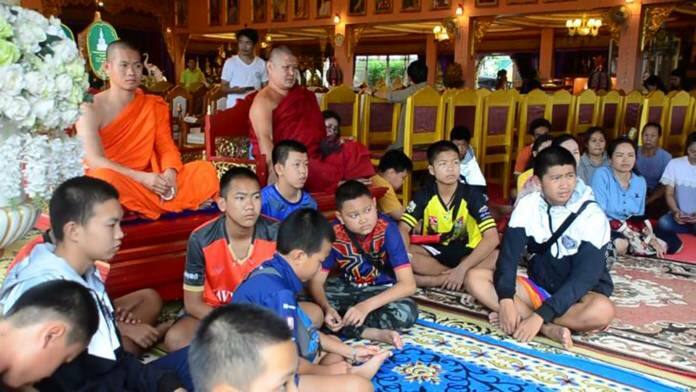 Chiang Rai, 4th September 2018 – The Governor of Chiang Rai province has met with the guardians and parents of Moo Pa Academy football team members who were stranded in Tham Luang Cave earlier this year, to prepare them for a thank you banquet being organized by the government this September 6th, to celebrate the united effort of rescuers from Thailand and across the globe, that succeeded in returning the youths to safety. Chiang Rai Governor Prajon Prachsakul and Mae Sai District Chief Somsak Kanakam had a meeting with Phra Khru Prayutjetiyanukarn, the acting Abbot of Wat Doi Wao, who is now caring for the coach of the Moo Pa Academy football team as well as the parents of the 12 boys who survived being marooned in flooded Tham Luang Cave for 17 days. The meeting at Wat Doi Wao was to prepare them all to attend a banquet being staged by the government at Dusit Palace in Bangkok on September 6th to thank the rescuers. Over 3,000 people involved in the rescue operation, including the team and their guardians, will attend the banquet. They are to travel from Chiang Rai on 72 buses departing on September 5th. As for members of the media still trying to interview the boys, the governor reminded them that the lads are still in state care and have not been permitted to speak with the media for fear of causing trauma. Journalists have been asked to formally request meetings with the young footballers through the Ministry of the Interior. At Government House, Minister to the Prime Minister’s Office Suwaphan Tanyuwattana, disclosed Prime Minister Gen Prayut Chan-ocha will speak at the banquet, about His Majesty the King’s gracious provision of aid for the 13. The intent of the event is to celebrate the unity and collaboration of the rescuers, as many were from different nations and belonged to different faiths, but put aside their differences to bring success to the difficult operation. The event will not be broadcast but those in attendance will be allowed to film proceedings and share their own footage.